Wholesale flannel in pink, blue, green, yellow and white, at this counter at the intersection of Sampeng Lane and Maha Chak Road. Today I will answer readers’ questions. See map at end of post for location of shops. I’m looking for colored stretch cord, for jewelry. I’m wondering if they sell it in Sampeng Market? 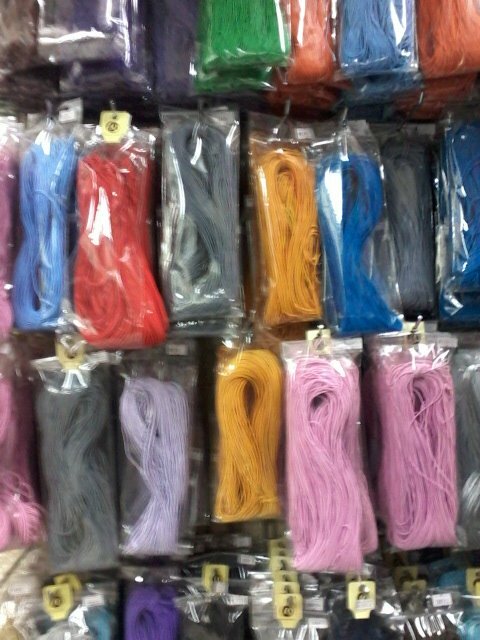 I saw spools of stretch cord in green, yellow, lavendar, blue, pink and black at Loa Kwean for 85 baht per spool. 123-125-127 Rajchawong Road, Sampeng, Bangkok 10100. Wattanaporn Pu Shop at 256 Sampeng Lane has a good selection of stretch cord. One pack is 120 baht and is 100 meters. They are open from 8:30 to 5:30 daily, Sundays 8:30 – 2:30. Wondering if China World shops accept credit cards? Do they do vat refunds? Please advise. Thanks. 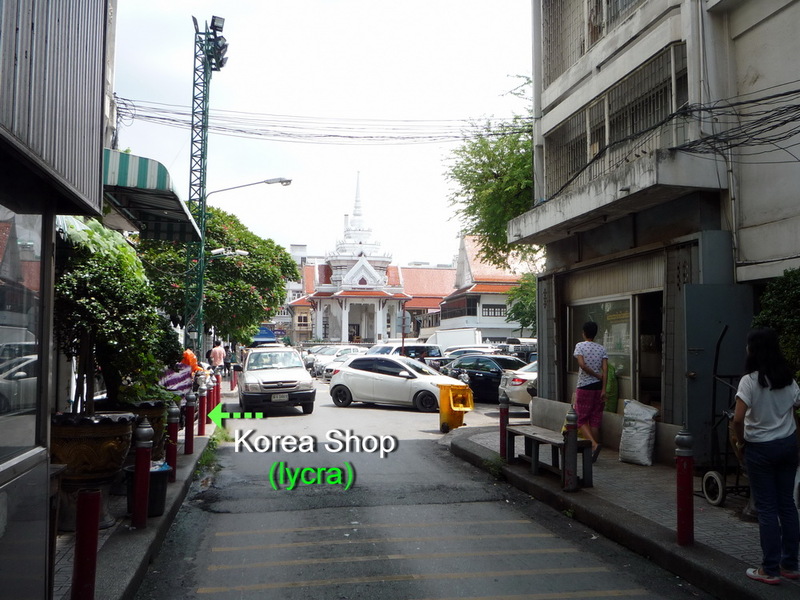 I asked at one shop and they said they accept credit cards on purchases over 2000 baht. But many shops do not accept credit cards. No VAT refunds. Could you explain where the Lycra shop is and name of shop please. I don’t know the Temple. Thank you. I was told it is dead town on Mondays, is that true? Should I avoid Mondays, please? Hello! I love this resource! Can you tell me if you’ve seen the name brand Moda in Sampeng? Also where can I find flannel? 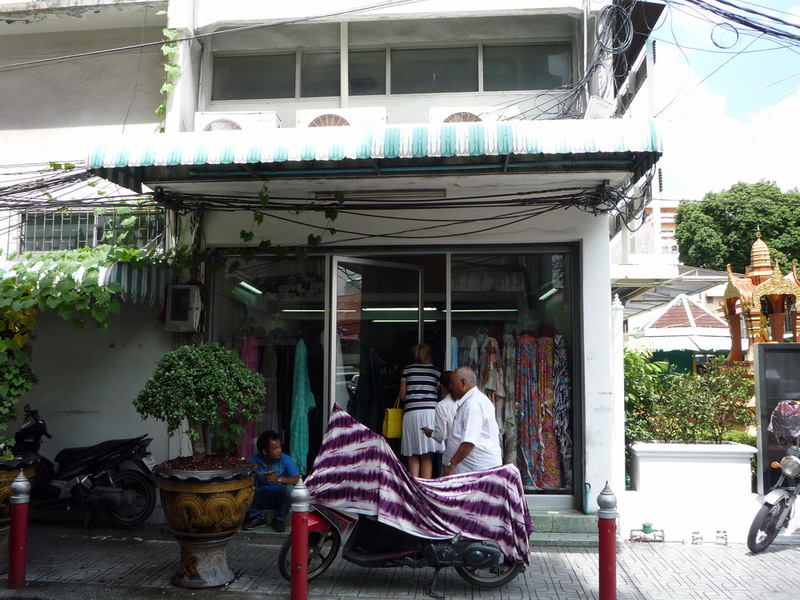 Moda fabric can be found mixed in with other brands at Kimono Shop on the corner of Yaowarat and Maha Chai Roads, diagonally across the street from Starbucks. There is a lady on the corner of Sampeng Lane and Chakrawat Road selling flannel. Not in a shop, but just at a counter on the side of the road. Hey, I stumbled across your blog while searching for a place to buy feathers in Bangkok. Can you recommend any? I make dreamcatchers so I am looking for feathers to decorate them. Bright mix of Turkey coquille feathers. Pornsawad Shop #60-62 Sampeng Lane has feathers at 35 baht each, or for 100 or more the price is 25 baht each. 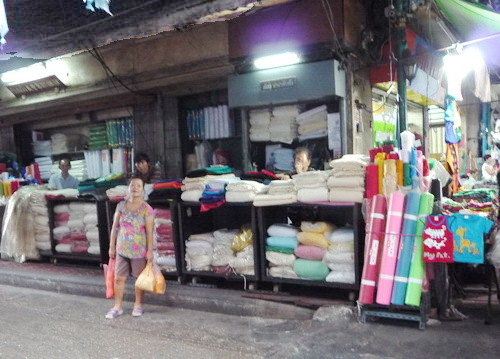 They also sell net, felt, burlap (sale 95 baht per meter), cloth bags, lace, bells, glitter, velcro in different colors, batting, lining fabric, TC (Tetron Cotton), and faux fur fleece (300 baht per meter). Hello I’m reading about places such as Pahurat, Sampeng lane and Chinaworld. Are these places located close to each other or are they essentially the same place? The are located close to each other. You can walk around all these places together and spend a full day shopping there. I want to plan a trip to purchase quilting fabrics. Could you give me addresses. So I can locate a hotel near by. If you want to start with an address right in the middle of Chinatown, try Grand China Hotel, 215 Yaowarat Road, Sampanthawong, Bangkok, 10100 Thailand. I made this custom map below including all the nearby hotels. 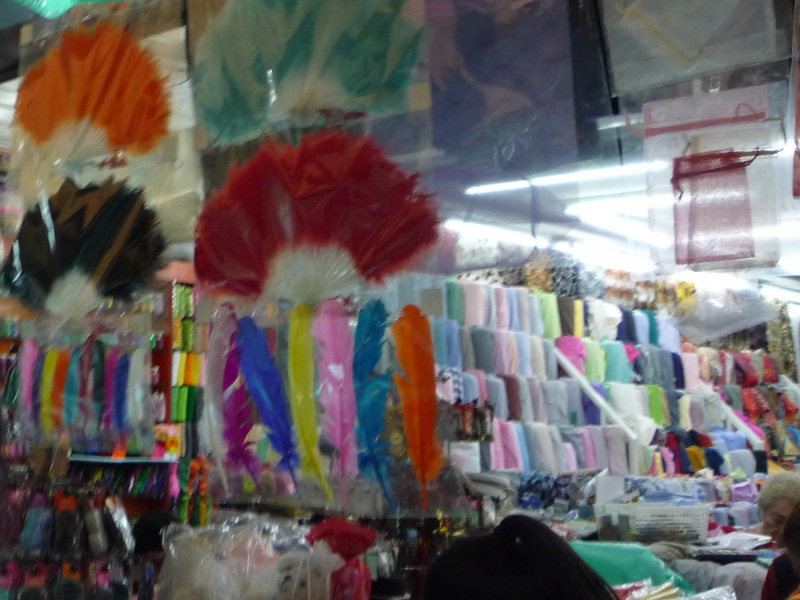 Hi Jill – do you know if the shop which sells feathers – 67 Sampeng Lane – Kijrung shop has ostrich feathers – I need at least 250 in orange, pink and blue (closer to turquoise actually)? How do I find a contact number for this shop? If you can help I would so appreciate it! Hello ,Jill . Your blog is really very helpfull and gives alot of interesting information . i would like to ask if u know some of good clothing manufacturer in thailand ? I am in search of Swarovski flat back crystals…I would be greatful for any help! Jill, my mother is in visiting me in Phuket for a few months and she is looking for double sided interfacing for a quilt she has in the go. Do you know a source either in Phuket or online in Thailand from where she could buy this?